FORT LAUDERDALE/DAVIE, Fla. – Call it CSI meets conservation. Stephen O’Brien, Ph.D., a research scientist at Nova Southeastern University’s (NSU) Halmos College of Natural Sciences and Oceanography, has worked with colleagues across the globe to create a DNA database of rhinoceros that will be used to help with the criminal prosecution of poachers. The research team included experts from the University of Pretoria’s Veterinary Genetics Laboratory, the Theodosius Dobzhansky Center for Genome Bioinformatics, St. Petersburg State University and African wildlife enforcement units. A new report addresses the illegal taking of African rhinoceros – an important conservation icon – by organized crime syndicates trafficking rhino horns to southeast Asia markets. Rhino poaching is uncontrolled and increasing, from a few incidents a decade ago to more than 1,000 per year today. The profits are enormous, and so far the risks rather modest. 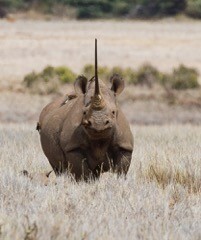 The study, published today in Current Biology titled Robust forensic matching of confiscated horns to individual poached African rhinoceros, describes a comprehensive effort to create a large database of individual rhinos’ composite short-term repeat-STR (also called microsatellite) genotypes so they could match confiscated tissue-DNA to real time crime scenes for prosecution. The team developed an extensive database of rhinoceros DNA profiles and demographic information named RhODIS® (Rhino DNA Index System), modeled after CODIS, which is the U.S. FBI’s criminal DNA database. The RhODIS® forensic system involved African wildlife ranger training and certification, a chain of custody compliant sampling methodology used for live and dead rhinoceros and rhinoceros horns, an eRhODIS™ field data collection “app” and state-of-the-art DNA genetic individualization. To date, more than 20,000 individual rhinoceros specimens and genotypes have been added to the RhODIS® database. These data include more than 5,800 forensic case samples where links were made between recovered horns, blood stained evidence items and specific rhinoceros carcasses. In the most recent cases listed in the report, this forensic genetic individualization allowed heavy punishments upon conviction, establishing international legal precedents for prosecuting and convicting smugglers of rhino horns suitable for other endangered species traffic. The applications highlight the legal precedent of utilizing the RhODIS® system for rhinoceros crimes and provide a benchmark for implementation of similar systems for global wildlife trafficking investigations of other species. African black and white rhinoceros (Diceros bicornis and Ceratotherium simum) are classified on as critically endangered and near threatened, respectively. Their continued survival is jeopardized by habitat loss and a surge in illegal hunting for their horns that are considered of both medicinal value and as a cultural status symbol in Asian countries, mainly Vietnam and China. More than 7,000 rhinoceros have been killed through poaching in the past decade across Africa with South Africa suffering the highest losses. The RhODIS® system also provides a comprehensive genetic resource that can be utilized to assist in the management of rhinoceros populations under increasing pressure due to the escalating and non-selective poaching across the African continent. As numbers decline and genetic variability is reduced in the remaining animals, the RhODIS® data is providing a tool to inform genetic management of selected populations to avoid inbreeding while maintaining reproductive potential of the survivors. About Nova Southeastern University (NSU): Located in beautiful Fort Lauderdale, Florida, NSU is ranked among US News & World Report’s Top 200 National Research Universities and is a dynamic, private research university providing high-quality educational and research programs at the undergraduate, graduate, and first-professional degree levels. Established in 1964, NSU now includes 16 colleges, the 215,000-square-foot Center for Collaborative Research, a private JK-12 grade school, the Mailman Segal Center for Human Development with specialists in Autism, the world-class NSU Art Museum Fort Lauderdale, and the Alvin Sherman Library, Research and Information Technology Center, which is Florida’s largest public library. NSU has campuses in Fort Lauderdale, Fort Myers, Jacksonville, Miami, Miramar, Orlando, Palm Beach, and Tampa, Florida, as well as San Juan, Puerto Rico, while maintaining a presence online globally. Classified as a research university with “high research activity” by the Carnegie Foundation for the Advancement of Teaching, NSU is one of only 50 universities nationwide to also be awarded Carnegie’s Community Engagement Classification, and is also the largest private institution in the United States that meets the U.S. Department of Education’s criteria as a Hispanic-serving Institution. Please visit www.nova.edu for more information about NSU and realizingpotential.nova.edu for more information on the largest fundraising campaign in NSU history.